Papago Park is the park that feels most like it is in the middle of a big city. Some of the trails skirt along major roads and a golf course. Office and residential buildings are never far off. It is also close to many bike paths/lanes and this makes it the easiest park to bicycle to (choose the “Bicycling” on this map under Satellite/Map view to see what I mean). 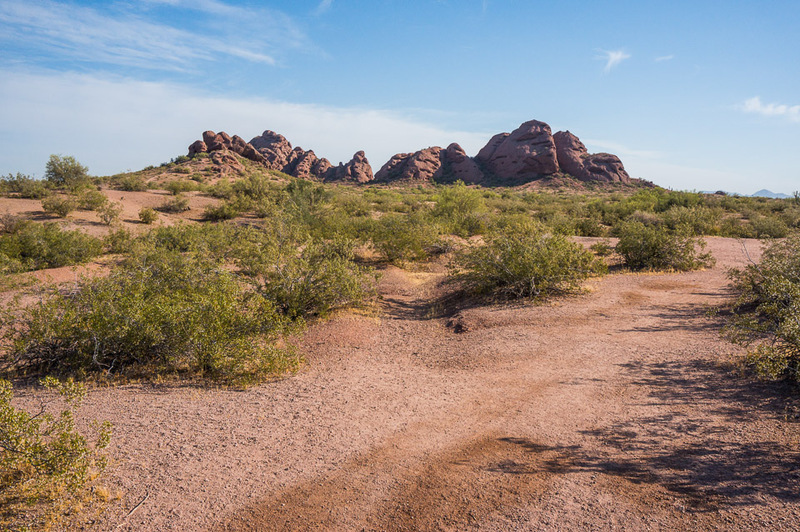 Papago Park trails are part of a larger complex that includes the Desert Botanical Garden, Papago Golf Course, Phoenix Zoo, and Hole in the Rock – which is a big rock… with a hole in it. There is ample parking right at the trailhead with a water fountain, ramada, but no toilet. There is another large ramada in the middle of the park. The most interesting feature is the amphitheater on the north side of the butte on McDowell Road. There is a second small strip parking lot on McDowell (see map below). A mellow landscape for a mellow hike. Nothing challenging, just easy clear trails up and around the two small mountains buttes. This is the best place in Phoenix for your first mountain bike ride. It doesn’t get any easy in Phoenix than this. The only thing to watch out for is the loose sandy spots when crossing the small gullies that crisscross the park. They aren’t much, but they are enough to sink your front wheel, so be careful of those and take them slowly. There are some other loose spots here and there to look out for that even experienced riders can sometimes get tripped up on. Easy by Phoenix standards, but for folks coming from groomed dirt trails will need some time to get accustomed to the sandy conditions here. This is where I’ll take my son when and if he wants his tires to see some dirt. All in all, a great spot for novice riders to get a start. The looping nature of the trails makes the whole place feel more like a mountain bike playground. The last time I was out, I looped around for 13 miles so there is enough fun here for intermediate riders. There is a section of small rollers that are fun and this would be an easy ride on a single speed. This entry was posted in Easy, Easy, Good Hiking Trails, Good Mountain Biking Trails, Hiking Trails, Mountain Biking Trails. Bookmark the permalink. Would these trails be okay for a gravel bike? Yes and no. The trails have completely changed since I wrote this post. Most of the original mountain bike trail was paved over with decomposed granite so that would be easy to ride on a gravel bike. And there are both fire roads and paved roads that cut through the park. The butte at the North East corner was not paved over though and that would definitely be a challenge on a gravel bike. Sometime last year, there were a series of new mountain bike trails that were cut through the park and while they are still pretty easy on a mountain bike, there are both rocky and sandy parts that would be tough on a gravel bike. The new trails are better than the old trails and there is now a great loop that goes around the golf course, butte, and then follows Galven Parkway back to the parking lot.